I can actually remember the turning point where I started always having a bag on me. I had always had little bags here and there. But I can remember walking around a department store with my Mom and asking her for a purse and she told me “you don’t wear them…if I buy it for you, you have to wear it all the time”. I’m sure if she could take those words back now she would. It would have probably saved her hundreds of dollars in purses throughout the years…and she may have avoided having a purse-thief in her closet. From that time, I always had a purse, even in high school I ditched backpacks and wore purses (in every color and style) instead. So there’s a long line of women that have created the bag lover that I am today and heres a little peek of some of the things that I’m currently toting around. I’m loving my Christmas present Michael Kohr’s bag– its the perfect shade of green and a material the wipes clean in seconds. I’m never caught without a calendar or a notebook to jot down some good ideas. I was lucky to score this Kate Spade wallet on a Kate Spade surprise online sale– it was such a steal! I unfortunately have two cell phones, but I can tell you its nice to turn my work cell phone OFF at the end of the day! How cute is this the Jcrew iPhone battery pack charger– just charge it beforehand and plug it in your phone for some extra juice throughout the day. You can’t see it too well– but I love my Kate Spade “lets do lunch” business card holder, Julep cuticle oil (miracle working), Revlon Lip Butter in Tutti Fruitti and my perfume Lola by Marc Jacobs in a handy rollerball for the road. Do you load yourself down too? 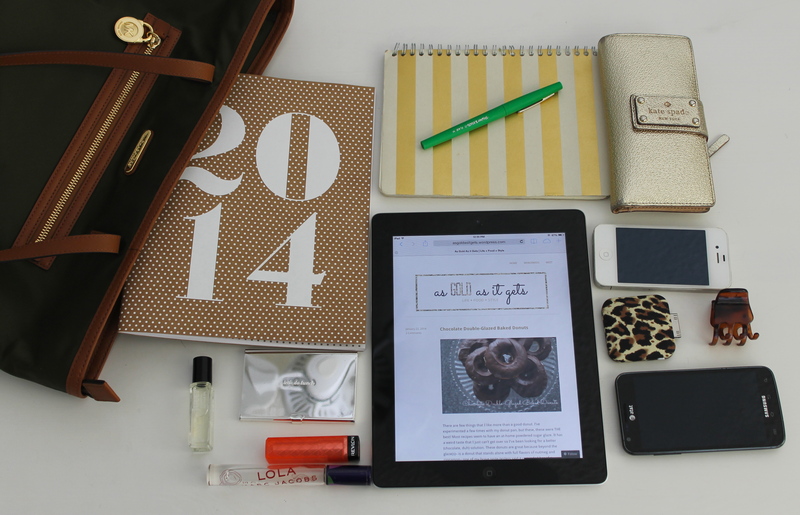 Is there any must-have’s in your bag right now? I’d love to hear! Categories: Uncategorized | Tags: julep, Kate Spade, purse, whats in her bag | Permalink. Categories: Good Looks | Tags: H&M, Kate Spade, kohls, old navy, OOTD | Permalink.